According to TMZ.com, a number of drugs were found on Scott Weiland's tour bus shortly after his death, including at least two bags of cocaine and the erectile dysfunction drug Viagra. The site obtained a copy of the search warrant the Bloomington, Minnesota police got to search Weiland's bus, and it shows they also found a generic version of Xanax; two different brands of sleeping pills; and buprenorphine, a drug that is supposed to stop the cravings and withdrawal symptoms that come with addiction. There was also ziprasidone, which is used to treat bipolar disorder and schizophrenia. Scott was diagnosed as bipolar in 2001. The police also found a bag of "a green leafy substance," which is presumably marijuana. Everything except for the pot was found in a bedroom on the bus. The document doesn't indicate if it was the bedroom that Weiland was found dead in. Weiland was 48 years old at the time of his death. A cause of death for the singer, who struggled for most of his adult life with drugs and alcohol, has yet to be determined. 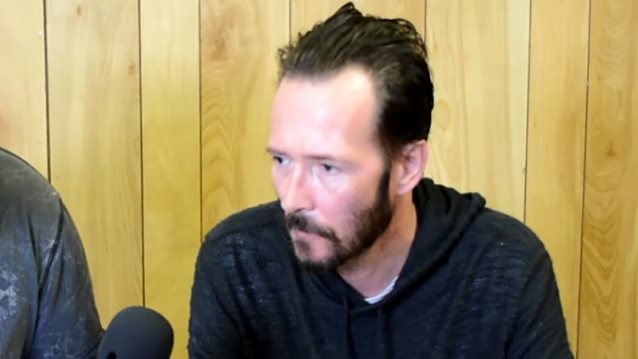 Police in Minnesota have said it could take "four to eight weeks" for the former STONE TEMPLE PILOTS frontman's toxicology report to come back. Weiland was on tour with THE WILDABOUTS in Minnesota when he was found unresponsive shortly before 9:00 p.m. They had been scheduled to perform Thursday night at the Medina Entertainment Center in Medina, Minnesota. However, that concert was canceled more than a week earlier because of slow ticket sales, according to StarTribune.com. The group was set to perform in Rochester on Friday (December 4) at the Wicked Moose.